Elsie Bainbridge is a newly wed when she learns that her husband, Rupert—who had gone to the family mansion his family had owned for generations, to repair and condition it for the arrival of his beloved—has died under mysterious circumstances. Overnight, Elsie inherits a dilapidated mansion in the country where none of the villagers want to work at, and the company of her late husband’s spinster cousin. The Bridge, the estate Elsie has just come into, is as neglected inside as it is on the outside. In one of her exploratory trips inside, Elsie finds a locked door, one that proves impervious to any attempt to open it. She makes arrangements with the headmistress to send for a locksmith but, before anyone can be sent for, the door is found open, revealing a treasure trove of odd artifacts inside, among them, a two-hundred-year-old journal from Elsie’s late husband’s ancestor, and strange figures—half painted, half statues—that have as purpose to serve as silent companions to the inhabitants of the house. Elsie’s cousin-in-law is quite taken with a couple of wooden companions and asks a servant to take them out before leaving the room. Soon, the whole house is full of them... and they seem to have ulterior motives. 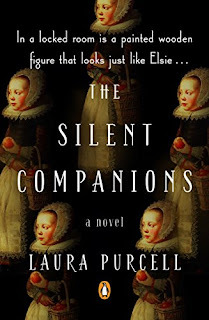 The Silent Companions is a splendid, beautifully written gothic novel, with images that rightly convey the atmosphere of isolation, helplessness and danger, with three parallel storylines: one set in the village of Fayford, England, where The Bridge is located, in 1635; one in 1865-1866, with events unfolding at a match factory in London, and also at The Bridge; and events set, approximately, in 1867, in an insane asylum. I found that both contemporary timelines were less repetitive and more compelling than the ancient one—at least until things took a turn for the worst in 1635—, because most characters, especially Elsie and Sarah, her cousin-in-law, were very compelling characters that projected the terror they were experiencing into the narrative, and thus to the reader. Right at the introduction of the novel, the publisher warns that this book shouldn’t be read at night, but I think it is precisely at night, or after dusk, amidst the most deafening silence, that this story works best. I read the novel at several times during the day and found it wanting, but it was especially atmospheric during the conditions I mentioned above. 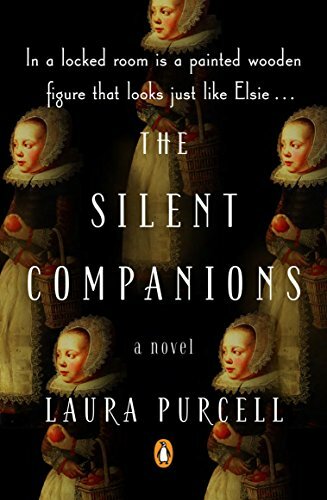 The Silent Companions has a sense of menace, an undercurrent of potential unreliability that gives depth and edge to this novel unlike anything I have encountered before in my reading. It helps that most characters have secrets and reasons for keeping their guards up at all times; those secrets are slowly revealed to great effect. Add to those elements a neglected mansion with an enigmatic headmistress, wounds that don’t heal, mysterious messages in the dust of a nursery that may or may not be tidy, wooden companions that may or may not move...It’s a spook fest. Disclaimer: I received from the publisher a free e-galley of this book via Netgalley in exchange for my honest review. I also bought my own copy. Wow! "Spook fest" would seem to be a very accurate description of this book. I know. The spookiness was nicely done. I thought I left a comment here yesterday. Perhaps you haven't seen it yet. I forget what I said. Lol. OK. Sometimes I forget to hit "publish." I think I wondered how you found this book and that it was good to have a book review from you. I know it's been a while. Before getting to this one I reached the 30% mark on two books and 10% on another before putting them aside because I felt the progress wasn't as fast as I needed/wanted. I'll be reading those in full next year. I found this book on Netgalley and it was chosen by Amazon's Editors as one of the best releases of the month of March. It's been waiting on my Kindle ever since, but with the R.I.P. Challenge, I thought it would be would to read it. I couldn't meet the deadline though. I have a copy of this book which I haven't read yet, so I'm glad you liked it. I don't know whether I'll be brave enough to read it at night, but I'm sure it will be more atmospheric that way! So these wooden figures turn evil in this big dilapidated mansion? Wow I can see where that would be a spook fest. Interesting cover too. Seems a bit of a page-turner. I'm so glad you enjoyed this too. I thought spook fest was a perfect description - and these wooden figures - brrrrr.